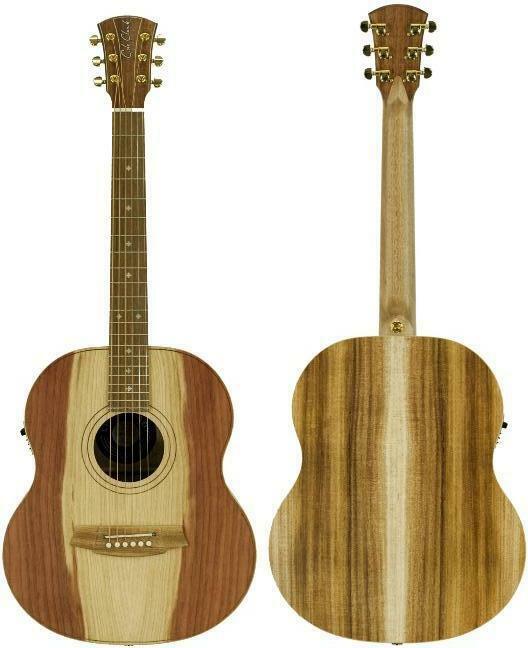 The Cole Clark Little Lady 2E Redwood Blackwood is beautiful little Australian made guitar by Cole Clark. The solid redwood top on this Little Lady 2 not only looks amazing but sounds incredibly bright when paired with it's solid blackwood back and sides. In fact, the sound which projects from this Little Lady makes this guitar seem like a much bigger instrument. The Cole Clark 2-way pickup system sounds clean and crisp when this Little Lady is amplified and the shorter scale length makes this guitar feel easy and comfortable to play. We at Haworth Guitars love this amazing Little Lady 2E in Redwood Blackwood by Cole Clark and believe that it's an incredibly well-priced acoustic guitar considering it's made in Australia from high quality all-solid timbers with pickup and case.